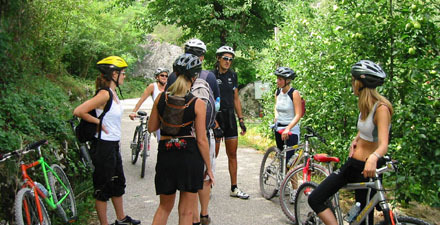 All BikeTrekking tours of GardaOnBike are designed for those who are passionate about gastronomic delights and wish to have a leisurely ride through the rich countryside, vineyards, orchards and olivegroves discovering the history and culture of the region. The terrain is rolling to flat and the distances are always manageable. We will also discover the incredible landscape of the Marocche which originated millions of years ago from the glaciers. During the excursion you will enjoy the delights of typical products and wines at one of the most beautiful local family-run wineries, and you will also learn many interesting things about winemaking. The romantic water-castle at Lake Toblino is the perfect set for beautiful pictures. After a nice lunch at the restaurant of Castel Toblino we will enjoy the atmosphere of this unique place in the park of the castle before heading back. 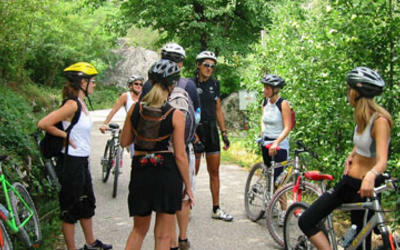 Because of our enthusiasm for biking, culture and nature we are committed to ensuring you enjoy your tour. Join us and bike out! Bring some money for the best ice cream in the region!